The IBM Sales Center for WebSphere Commerce V6 is an application for customer service representatives to capture and manage customer orders. 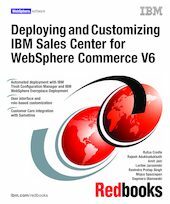 This IBM Redbooks publication helps you understand IBM Sales Center for WebSphere Commerce and provides you with how-to instructions to deploy the business solution, customize it, and integrate the Sales Center with other applications. This book helps you install, tailor, and configure the Sales Center development environment and production environment for creating and deploying the Sales Center customizations. In addition, this book discusses the use of IBM Tivoli Configuration Manager and IBM WebSphere Everyplace Deployment, to perform automated deployment. This book discusses how to plan and design Sales Center customizations. Examples are provided to help you through this process. The customization scenarios that include the integration of additional IBM software and original equipment manufacturer (OEM) software are described. This book provides user interface and role-based customization examples to demonstrate customization within the user interface framework and the role-based tools. This book also provides code sample that you can use to integrate IBM Lotus Sametime V7.5 into Sales Center, where live help and customer care functionality are achieved. Note: Code samples will be provided via Additional Materials after legal authorization is issued.